In the new Amazon AWS Certified Developer boot camp - students ow to use the AWS SDK to develop secure and scalable cloud applications. In Addition - Students explore how to interact with AWS using code and discuss key concepts, best practices, and troubleshooting tips. In the next section of this boot camp - students learn the most common DevOps patterns to develop, deploy, and maintain applications on the AWS platform. Additionally - students will explore the core principles of the DevOps methodology and examine a number of use cases applicable to startup, small- to medium-sized business, and enterprise development scenarios. While attending this camp - students take two exams to achieve the Amazon AWS Developer Associate and DevOps Engineer Professional certifications. The Certification Camps AWS Developer / DevOps bootcamps are designed for software developers who want to learn how to develop cloud applications on AWS. 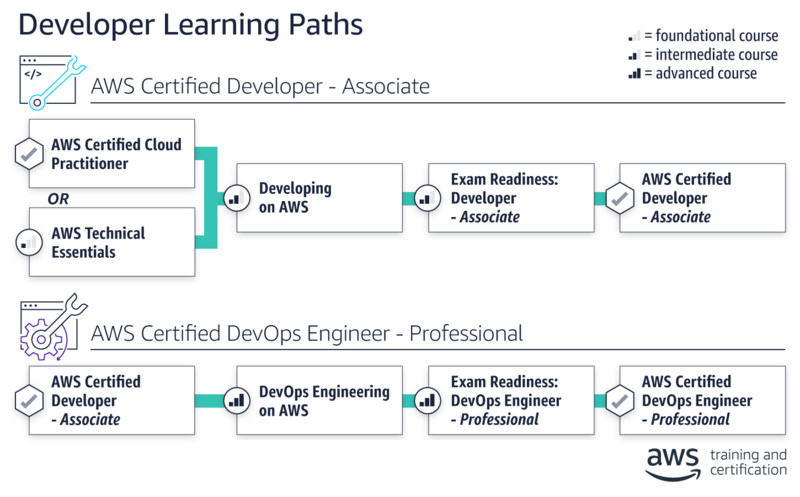 Build your technical skills and progress along a path to earn AWS Certification with these courses, labs, and exams administered in this camp.